Valentine Poem Written to Mary Johnson from Unknown Writer from the collections of the Worthington Historical Society (WHS) may be used for educational purposes as long as it is not altered in any way and proper credit is given: "Courtesy of the Worthington Historical Society, Worthington, OH." 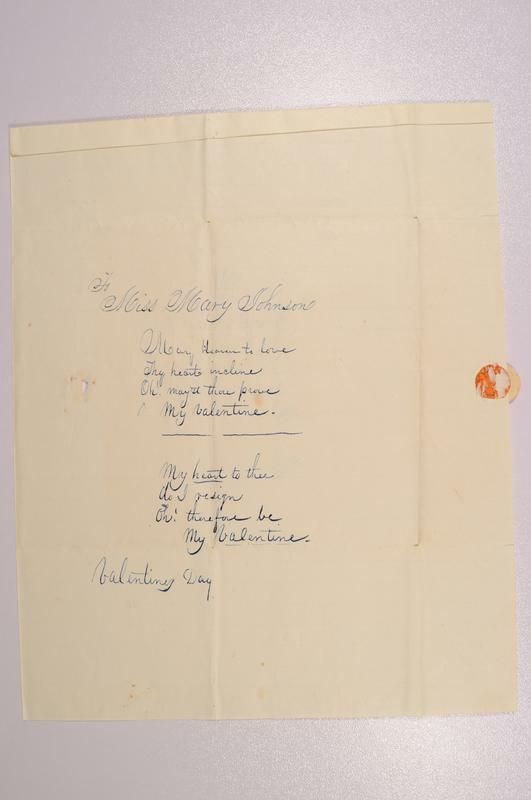 Prior written permission of the WHS is required for any other use of Valentine Poem Written to Mary Johnson from Unknown Writer. Contact WHS at info@worthingtonhistory.org to request permission. Valentine Poem Written to Mary Johnson from Unknown Writer is text, with genre poetry and correspondence. Its dimensions are 10 in. x 7.81 in.. It was created sometime around 1823-1846. Worthington Historical Society is the Contributor. Mary Sessions (née Johnson), 1823-1919 is the Addressee. This is a Valentine's Day poem written to Mary Johnson of Worthington, Ohio from an unknown writer. In the poem, the writer asks Mary to be his/her Valentine. It covers the topics history, Orange Johnson House and poetry. It features the person Mary Sessions (née Johnson), 1823-1919. The Worthington Historical Society identification code is 2012.0005.41. The Worthington Memory identification code is whs0989. This metadata record was human prepared by Worthington Libraries on May 23, 2017. It was last updated December 6, 2017. It's February: the month of cupids, flowers and those chalky little heart candies with messages for your sweetheart. Our exhibit bids homage to Valentine's Day with an assortment of romances from Worthington's history.